This is just a quick update on what has been happening here on Ama Dablam. After having spent a week at base camp acclimatising and climbing up to the saddle at the bottom of the ridge, Katharina and I came down to Dingboche for a couple of nights as her cough had not improved. On Friday night, Hiro, Phurba Tashi, Gyalzen and Tashi stayed at Camp I and are trying to make more progress on the mountain on Saturday. “We will see how the conditions are further up and then make a decision,” I heard Phurba Tashi say in the radio. 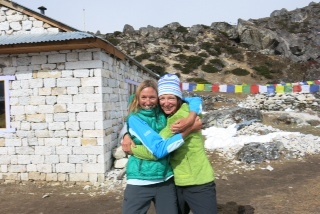 While Katharina relaxed and recuperated in Dingboche on Friday, I went on a little tour to see some friends. I walked from our little village at 4,000m to the south side base camp of Ama Dablam to see my friend Lydia from New Zealand, who was “stoked” to see me. Lydia is certainly one of these people, who certainly justify a 3 1/2 hours walk just for a chat and a cup of tea. It was lovely to see her and find out how they are doing on the south side of the mountain. Apparently they are having similar problems with the snow and the route is certainly more difficult than in other years. “We have only been to 5,800m so far and we will see how the rope fixing is getting on further up,” Lydia said. On Saturday, Katharina and I will slowly walk back to base camp and if conditions and the fixed ropes allow, we will hopefully climb to Camp I on Sunday and spend the night there. Let’s hope it will all work out as it would be lovely to finally get our hands on the North ridge. Once again, thanks to all of you for your support and interest and I hope you are enjoying my little progress reports from the mountain. Have a great start of your November – no matter whether it means the beginning of your summer or your winter! Hi Billi.. or cat it will be in Hindi. Liked your blog on Kathmandu marathon. Good luck and hope to have better condition there.